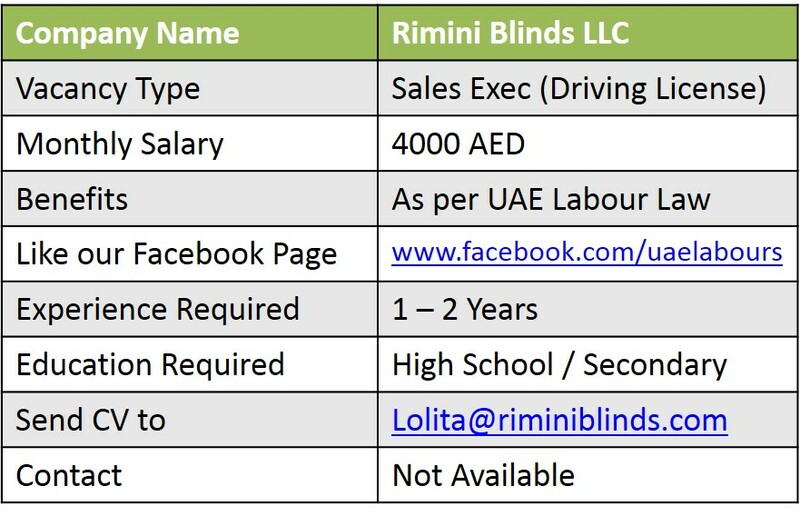 We Rimini Blinds LLC is looking to hire a FILIPINO Sales executive with Manual Driving License. 1: Visits customers with window blind &amp; curtains samples. 2: Assists customers by showing the fabrics and suggesting items. 3: Advises customers by providing information on products. 4: Helps customer make selections by building customer confidence; offering suggestions and opinions. 5: Documents all surveys on worksheet and processes all surveys via IPad. 6: Processes payments by totaling purchases; processing cheques, cash, and credit cards. 7: Keeps clientele informed by notifying them of preferred customer installation date. 8: Assists and supervises at time of installation. 9: Contributes to team effort by accomplishing related results as needed. 1: Must have already 1-2 years experience in this type of work. 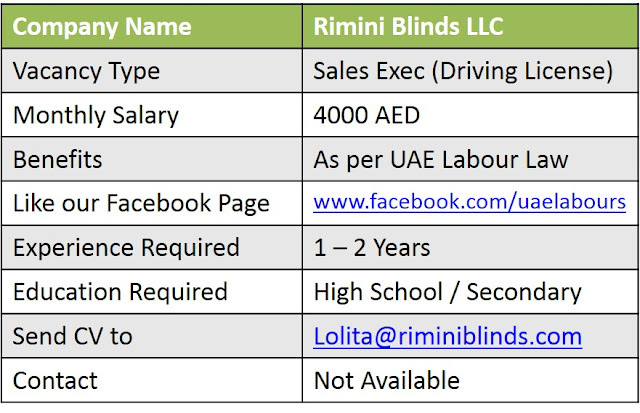 2: Must have UAE driving license for manual vehicles. 3: Required to sell and install window blinds, curtains and shutters, experience of this is preferred. 4: able to use tape measure and operate power tools. 5: You will be supervisor to 1 installation technician who will assist you as a 2 man team. 6: Must be presentable and be able to read, write and speak fluent English. Listening, Customer Service, Meeting Sales Goals, Selling to Customer Needs, Product Knowledge, People Skills, Energy Level, Dependability, General Math Skills, Verbal Communication, Job Knowledge. Benefits: Health Insurance, Sales commission, incentives. Contact: Send your updated resume with latest passport size picture at below email address. We have achieved more than 712 errands till now, every one of the endeavors we have done are master adequately. We have a far reaching number of satisfied customers; we work for the satisfaction of the customers. Home internal parts UAE is an organization outfitting association that outfits the customers with staggering cleaning, sewing and settling organizations of various sorts. We have the most amazing wrap Curtains and Blinds Dubai , we do all what the customers' solicitations from us concerning settling. Thank you for sharing this, this is a very nice blog, Search for best suitable job vacancies in Philippines top companies & apply for IT, MBA, finance, BPO, KPO & other jobs.